NASA's MESSENGER spacecraft will execute the second of three planned Mercury flybys on Monday, as it loops through the inner solar system on a trajectory that will take it into orbit around that planet in 2011. Mercury has been relatively scantily studied up until now because it is so close to the Sun and it is very difficult to get there. Only one spacecraft, Mariner 10, has flown by it before before - three passes back in 1974 and 1975. What we know about the planet is that its surface is heavily cratered, with plains formed by volcanic eruptions. It has an extremely thin atmosphere. It is a place of temperature extremes: 840 degrees Fahrenheit during the day, -275 degrees at night. It is only about 43 million miles from the Sun - so from the surface of Mercury, the Sun would appear about two and a half times as large in the sky as it does on Earth. It revolves around the Sun once every 59 Earth days, and rotates on its axis very slowly...once every 176 Earth days. So on Mercury, a day is longer than 2 of Mercury's years! The first MESSENGER flyby occurred on January 14. The probe sent back pictures of approximately 20% of the surface that had never been photographed before. Monday's flyby will have the spacecraft passing just 125 miles above the surface. The overarching goals of the mission are to photograph the planet in its entirety, and to learn more about its composition, structure, and magnetic field. "Surface temperatures range from about 90 to 700 K (-183 °C to 427 °C)"
Polar Ice determined via Earth based radar. Colonizers will live in polar igloos ? "once every 176 Earth days. So on Mercury, a day is longer than 2 years! " If Mercury rotates on its axis once every 176 days, wouldn't a day be 176 Earth days?? That's obviously not longer than 2 years. Mercury "revolves around" the sun once every 59 earth days. The article says it "rotates the sun once every 59 earth days". Maybe I'm too old to remember things from my elementary school education, but I thought the preferred terminology was ROTATE in an orbit around a central point versus REVOLVE around an object's central axis? Mercury ROTATES on its axis very slowly as it REVOLVES around the Sun very quickly? Is the word "revolve" no longer in favor among the astronomy community? "It rotates the Sun once every 59 Earth days, and rotates on its axis very slowly…once every 176 Earth days. So on Mercury, a day is longer than 2 years!" Ummm....no. If Mercury rotates once every 176 Earth days, then there are two Mercury days in an Earth year. 176 Earth days are longer than 2 years???? Yippee! When can we move there, and do they have a crashing financial system too? I wonder what other questions the fly by will create for scientists. It's always so exhilarating to discover things we didn't know. My match must be getting fuzzy. The article states that Mercury revolves about its axis once every 176 days, and therefore one day on Mercury takes 2 earth years. Somebody, wake up. It's just half an earth year per Mercuric day, not 2 years! If mercury rotates every 176 earth days then wouldn't that mean two mercury days is about 1 earth year? Both the day and the year in the last sentence are Mercurian, i.e. with respect to Mercury. It rotates on its axis (creating days) slower than it revolves around the sun (creating years). Interestingly, if there were no rotation at all the sun would still appear to an observer on the surface to move around the planet once per year. This is the difference between calendar days and sidereal days on earth. We normally assume that a day is the time it takes the sun to move from noon to noon but the rotation rate of the earth is slightly different (than 360 degrees divided by 24 hours) since the earth has also moved slightly around the sun. And yes, it should be revolves around the sun while rotating on it's own axis. Readers, the author means that a Mercury day is about twice as long as a Mercury year, not an Earth Year. But actually, the author has made quite a number of mistakes. 1. As others already pointed out, she confuses the concepts of "rotation" and "revolution." 2. Mercury's mean distance from the Sun is about 36 million miles, although its orbit is eccentric and varies between 29 and (the author's stated) 43 million miles. 3. Mercury's rotation period of 59 Earth days is not the same as its day. A day on Mercury - the time it takes for the Sun to "appear" to revolve around Mercury [apologies to Copernicus] - is actually 88 Earth days. This is because, in 59 Earth days, Mercury will have traveled 1/3 of its orbit, and the Sun will appear to have moved 60 degrees. Sorry if I've confused you; I'm sure there must be a much explanation somewhere on the web. The article could be correct. The planet is rotating on its own axis every 176 days, but also rotates around the Sun. Its rotation around the sun "slows down" its day–day is a relative term in this case, meaning the length of time that a location is in sunlight.. Kinda like the Moon, which always has the same side facing Earth. It doesn't rotate at all on its axis. Yet it has a14 Earth-day "day" on its far side, because that side is exposed to the sun for half its rotation around the earth. It's High Noon on the Moons far side when it is a New Moon as viewed from Earth. Alright so I'll try to clear up some of this confusion. Mercury rotates on its axis once every 58.7 Earth days. Here on Earth we obviously rotate once approximately every 24 hours. Hence, we have a definition for an Earth day. However, Mercury takes 88 Earth days to complete an orbit. The article states the Mercury rotates on its axis once every 176 days. This is NOT true. The article also states that it "rotates the Sun" (whatever that means) once every 59 days. I think Kate here has gotten a few facts mixed up. Mercury does experience a 176 day long solar day (basically how long it takes the Sun to cross the sky, set, and come back up to meet in the same position it "started"). This is due to the mechanics of it moving around the Sun while it rotates rather slowly. This is due to Mercury rotating three times while orbiting the Sun only twice. So in essence, a solar day (seeing the sun rise and set and then return to the same position in the sky when it was first observed), would take 176 days and thus mean that Mercury's day is twice as long as it's year, but that is only apparent. If you define a day by the time it takes to rotate, then Mercury's year is 1.5 times longer (not half as long). Think about it... on Earth the Sun does not rise and set at the same time every day. We have solstices and equinoxes. Days get longer as the summer solstice nears (the longest day) and shorter as the winter solstice nears (the shortest day). This is due to the fact that the Earth actually rotates 366.26 times per year, but if we only look at the Sun returning to the same position in the sky, it would seem to indicate that we rotate at 365.26 times a year. The difference is small, so for the most part we don't really take note of it. This article should say that it revolves around the Sun once every 88 Earth days, but the time it takes the Sun to rise and set would take 176 days. Thus, for every two years on Mercury, there is only one sunrise and sunset. Whoops ... I made my own mistakes in my previous post. First, Mercury's year, not its day, is 88 Earth days. Second, if we define a day as the time it takes for the Sun to reappear at the same location in the sky (e.g. directly overhead), then that will take 176 Earth days. That's the reason why a Mercury Day is twice as long as a Mercury year. Kate, you've updated your article and made some corrections, but you still have some of the stats wrong. 1. 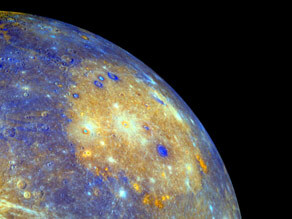 Mercury revolves around the Sun (its year) in 88 Earth days. 2. Mercury rotates 360 degrees on its axis in 59 Earth days. 3. A Day on Mercury, for example sunrise to sunrise, takes about 176 Earth days. You folks had me worried there for a bit. I see it's all been cleared up now; Mercury Day and Merury Year. If you think a day on Mercury seems confusing, then wait till you hear about Venus. It rotates slowly in the opposite direction as the other planets. The Sun, if it were visible through the clouds, would sometimes appear to change direction. Derek, a minor correction for you. The length of an Earth day does not vary through the year, only the proportion of daytime versus night. And this is due to the inclination of the Earth's axis with respect to its orbit, not because of the number of rotations per orbital revolution. But other than that, your explanations were much better than mine. There may not be huge oil reserves there, but the prize of all planets, the core, is surface close. Frozen Mercury pole dwellers, sinking mining shafts. What will they find ? Iron, yes. But Diamonds, Gold, Kryptonite, Protonium; unknown treasures from a Space Blackbeard Pirate's magical chest. Oh, no ! Pandora got there before, Just her box. Not enpty. Open it or not ? Giand Super Particle collider, Stargate to Niburu ? Ready to push the button to eternity ? link to the Earth Large Hadron also ? Ray G; October 3rd, 2008 4:33 pm ET "Derek, a minor correction for you. The length of an Earth day does not vary through the year"
One thing, concept you can never be rong about, is that you are always wrong. This the law, not even disobeyed by God. Proof ? Self contradicted, by annahilation ended, is faith hidden object, God. Yes ! Earth day does vary, skirting gravitational wells. Slowed down by Einstein - a faster than b - b faster than a –. The really only relatively confusing gives the observed Mercury calculation agreed orbit. Alpha Centaury Aliens, via the Super Protonium Collider. Franko ... As Curie played with Radium, might not Einstien have played with Mercury to the same end result? And with Feynman on drums and Hawking on keyboard, with Hubble on hold and Phoenix rising, might not we all have been taken in, if only briefly, by the songs of right-ous whales? Mercury's "year" is 88 days. Mercury is like with respect to the sun's motion. make the sun get to the same place in the sky due to orbital motion. So stars viewed from Earth rise 4 minutes earlier each day. Ray, I knew that the actual Earth day itself doesn't get any shorter. That part is obvious as we rotate at a constant speed (or should I say velocity... even though the direction is not linear?). In my post I tried to say that, but I suppose I wasn't clear on that account. There is an obvious difference between a solar day and a sidereal day. However, I will admit to my mistake on the reason for the proportion of day and night. Thanks for clearing that part up. Also, thank you for the ending compliment. "a day on Mercury (sun rise to sun rise) is 176 Earth days long"
Too fast and fry, too slow and freeze. Good inbetween Suntan ? Or walk a lot slower near the poles. Big polar located domes, the only possible human Bible ordered, settlement ? All you people are so worried about the calendar..All I want to now is what TIME is it there? Mercury's mean distance from the Sun is 39 million miles. One Mercury year (the time it takes Mercury to complete one orbit around the Sun is 88 (Earth) days. One Mercury day (the time it takes Mercury to rotate once on its axis) is approximately 59 (Earth) days. Mercury's dayside temperature is 800F. Mercury's nightside temperature is -300F. The problem that the author of this article seems to be having is understanding the difference between a Solar Day and a Sidereal Day. I have never been comfortable using Mercury's Solar Day as any form of reckoning simply because over the course of a day the Sun can actually appear reverse course in the sky in apparent retrograde motion. I seriously doubt that anyone will ever live on the surface of Mercury. If anyone ever inhabits this world they will likely live below the surface rendering the Solar Day useless anyway. It would be nice if these sorts of articles were written by people who are scientifically literate instead intellectually lazy. Aren't there any science writers at CNN? Maybe one person who can check over these things so they aren't so fuzzy and poorly written? As for what time it is there?... same as here. Praise him and magnify him for ever." Bud, that is a mineralogical image I believe, meaning that it is color-coded to represent what minerals are present. Just use Google to find true-color images. It looks a lot like our own Moon. this is what happens when stupid people read science articles. It takes mercury 176 earth days to complete one mercury day. it also takes mercury 59 earth days to complete an orbit around the sun, (that is a mercury year). therefore two mercury years is 118 earth days which is less time than 176 earth days for 1 mercury day. so 1 mercury day takes 58 earth days more to complete than two mercury years. Mercury rotates at anywhere from 1,000-8,000 RPM depending on how hard you push the gas pedal. its tyring to say that Mercury rotates on its axis once every 176 Eath days so that it maens that a day on mercury is 176 days on earth, what the writer is trying to get at is that mercury orbits the sun completley every 59 eath Days. so it take mercury longer to rotate on its axis (176 days) then it takes for the planet to go around the the sun (59 days). I also thought, Mercury image, painted especially, for the chosen of the Universe, God's people, Humanity.. Alien races have dark and depressing grey Moons ? Serves them right ! But if we send them the Bible, Bagva Gita, Khoran, via the Arebico Radio Telescope. Their Moons will also become colored by their faith. Send me donations, to spread the faith, brighten the universe. Happy, contended, colored are the Aliens. OMG! From most of these comments, I can only conclude that our public school system is a disaster! More reading, perhaps a little thinking, no posting!!! To figure it, just apply the logic from the TimeCube. Four corners. Dawn and Sunset. Noon and Midnight. Hang your hat on the only, always correct, theory of all. Previous spaceceaft have not spied the poles. Dwellings of the Nepharin. What are the average temperatures at the north and south poles? Does this planet's rotation wobble like the earths so that you have the period of cooler temperatures folled by a period of Warmer Temperatures ? It gets even more interesting to an observer on Mercury. Not only are the days long, but because of its rotation, revolution(solar orbit) relationship, during a Mercurian day, the Sun will rise, stop, and set where it rose then rise again, progress to the west, then set, rise where it set, then rise, then set again until you have Mercurian night. How hard is it to understand that Mercury takes 88 Earth days to orbit the Sun once? How hard is it to understand that Mercury makes one rotation about its axis once every 59 Earth days? So Kenneth, this is what happens when stupid people think articles are 100% true all the time. No, it's not. USE GOOGLE PEOPLE IF YOU HAVE TO. "A year on Mercury (the time it takes to orbit the sun) is equivalent to 88 Earth-days. It takes Mercury 59 Earth-days to spin around once on its axis. Because Mercury completes three rotations for every two orbits around the sun, a full day (the time it takes for the sun to return to the same point in the sky) is almost 176 Earth-days. That makes its day twice as long as its year. " Franko, what kind of dribble is that? "Franko, what kind of dribble is that?" I worked with a ex-Soviet scientist a few years ago – – – for obvious reasons I will not mention his name. He once told me he was at a meeting where "blueprints" (technical drawings and specifications, etc) for the US space shuttle were being discussed. He told me that Buran was nearly an exact copy of the US shuttle. He said that after the Challenger accident they decided to cancel the program. In his words, "If the USA can't make this thing work, we certainly can't". On a slightly different topic; we have been systematically "educated" regarding the evils of the CIA. Most of the charges are probably true. However, what about the KGB? People are only too willing to speculate about CIA plots, what about KGB plots? Are these guys angels? I have no doubt that long term "destabilizing" programs were set in motion by the CIA and KGB. These programs had too much inertia to simply "go away" after the cold war. I have to wonder how these plans are playing out today. Mike... Did you loose your marbles? It should be "A day on Mercury is longer than 2 Earth years" – not Mercury Years. "The period of the orbital motion is 87.969 days, and the period of the rotation of the planet around its own axis is 58.65 days, i.e. precisely 2/3 times the orbital period (resonance)"
Rotates 3 times in 2 orbits, hence the one Solar Day on Mercury. Complicated by elliptical orbit, 2 sunrises in one morning, certain places ? If we could get rid of the 3/2 resonance. rotates too fast. 1:1 and constant Sun or dark, with rocking back and forth at the edges. Stig: I think the economy is causing quite a lot of people to lose their marbles as is evident by some comments here. Maybe the author can shed some light. "Mercury’s current configuration is minimum energy state of tidal friction"
Niburu coming 2012, to upset orbit day calculations. "What is the airspeed of an unladen swallow?" Laws of Physics applies also to Stone Buzzards orbitting Mercury. I'm surprised nobody has mentioned yet that gravity truly does not exist. Much of what you have discussed only points further to the honesty of the statement: gravity does not exist. Something does not exist ? Nothing exists ? dimensions. Moving Dimensions Theory accounts for the aetherless aether." here's some strange crenelations on Mercury – what to make of it? Pretty weird. "on mercury a day is longer than two years which sounds weird"
Venus is retrogade rotation, so, (-)117 days from noon to noon ? The dolphin saving you one is the best one!